Launch a charged particle into a chamber. Charged particles can be added into the chamber to influence the path of the moving particle. The launch speed can be changed as well. Try to match a given path by manipulating the fixed particles in the chamber. Understand that electrically-charged particles can exert force at a distance. Determine that like charges repel and opposite charges attract. 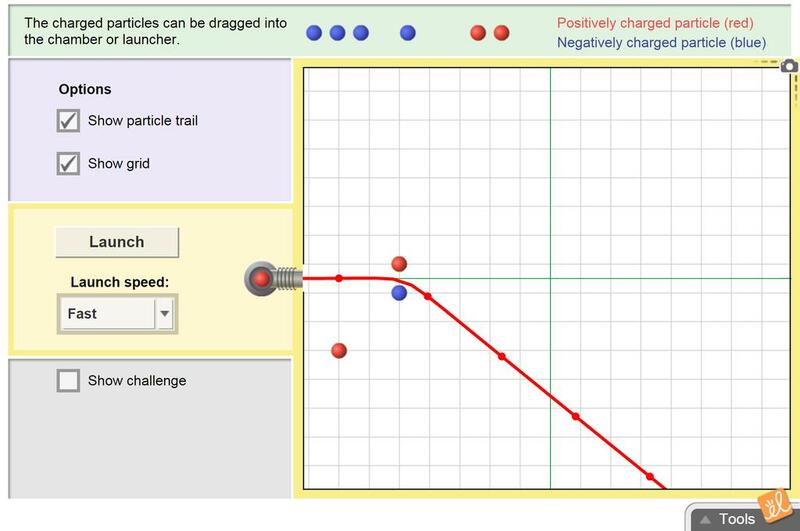 Predict the path of a launched charged particle based on the position of one or more fixed charged particles. Match a given path by manipulating fixed charged particles on a grid. Students will experiment with magnets and explain what is happening through words and drawings. They wi... (more)ll use the Gizmo, then complete the extension questions. Activity B of the Exploration Guide says to paste screenshots into a document. If your students do not ha... (more)ve documents to paste into, this sheet is a good substitute. Can visually see the interaction of charges. Students have fun with this too.